So yesterday we talked about the Less Is More (LIM) selections, that make up the daily part of the Bet Less Win More service, and the profit from yesterday’s LIM was 0.25 points. I’m sure many members made more than 0.25 points, I cashed out for a profit of 0.7 points. And as I said yesterday because of the strike rate of these selections the stakes can be quite high and £100 stakes saw me make £70 on the day. But anyway let’s move on to the Staggered Accumulators which are the other part of the service. You know what an accumulator is, you make a number of selections and instruct your bookie to place your stake on the first selection and if that wins then all the returns from that first bet go onto the second selection and so on, if all your selections win then you win if one fails then you lose. Staggered Accumulators are different in that we manage the stakes manually and we don’t have the pressure of finding all our selections at the same time we can wait for very high probability bets. The other key part of this strategy is that we return our stake to our bank if the first bet wins. Which means if the first selection wins then the rest of the bet is free, we only lose if the first bet loses. For example if we start with a £10 stake and our first bet in the acca wins and we get odds of 2/1 then we will get a return of £30, £10 will be our stake returned and £20 our profit. So we return the £10 returned stake to our bank and place the £20 on the next selection in our acca. Step 3 – Place all the profit from bet 1 on another Grade A high probability bet. Step 5 – Keep the accumulator going until the Big Hoo Ha Win! Today’s LIM goes in the 1:20 and you can trial the service for just £1 and get immediate access to that selection. 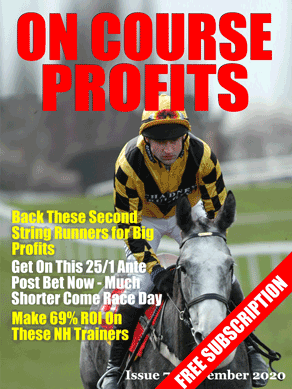 There will be no more £1 trials after Friday so if slow and steady profits with the occasional Hoo Ha is of interest get in now. Next Article Your Favourite Rogue….